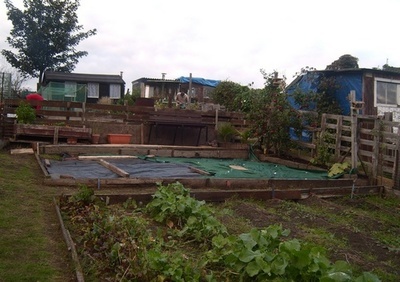 “Digging over plot before Winter"
October is often viewed as the last month in the year when it is possible to do any real work on the allotment as November through to February are often cold ,wet and windy. This is the best time to get on with other jobs such as digging over your vegetable beds in readiness for the next years growing season, cleaning and oiling gardening tools,turning over compost heaps, tidying your garden shed and cleaning the glass in your greenhouse. The FEDAGA Potato, onion and shallot scheme is currently underway and orders should be with your Site Rep before the end of October. There is a great variety of potatoes to choose from and why not try some varieties that you have not grown before? Now is the best time of year to apply a generous quantity of farmyard manure to your vegetable beds to replenish the goodness which has been taken from the ground by this year’s crops. Part of this compost may come from your own compost heaps which should be turned over to remove any useable material and the remainder of woodier material and partly decomposed vegetation can then be returned to the empty compost bins to complete its journey to useable compost. Remember that diseased plant material should not be composted and should instead be burned or sent to landfill. This month is the deadline for planting out Japanese onion sets .These are hardy, short-daylight onions so in theory should bulb up about a month earlier next year than normal onions . I tried these before but had a very disappointing result probably because of the Scottish climate. It should also be borne in mind that they don’t store as well as normal onions. Garlic is normally planted out in November however if you are planting winter onions then it would also be a good time to get your garlic underway. It is also possible to sow other vegetables to overwinter like onions, lettuce, spinach and broad beans .They may not all with survive, but if they do they can provide an early harvest come Spring.